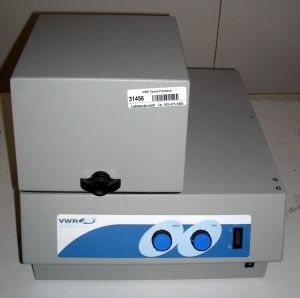 Product Description This VWR Hard Tissue Homogenizer (Mini Micro Shaker 980140) has analog (dial) time and speed controls. These homogenizers are designed for high-throughput sample processing in microplate or vial set format to produce effective homogenization of hard tissue samples, including animal tissue, seeds, tubers, leaf punches, soil and sediment samples, insects, and microbial cultures. They are also suitable for isolation of protein, DNA, RNA, viruses, and other biological components released during homogenization, as well as for dry sample pulverization for chemical analysis and solubility studies. The shaker produces a reciprocal motion optimized for grinding difficult samples, and the high speed linear motion processes samples quickly. In most cases, samples are processed in two minutes or less. Homogenizers feature an easy-to-load tray that securely locks the microplate or vial set in place, analog controls, and an electronic timer. Homogenized samples can be handled manually or in an automated system. Timer 1 to 10 min. ALL ACCESSORIES MUST BE ORDERED SEPARATELY FROM VWR: Grinding vial sets (to be ordered separately from VWR) combine the benefits of the microplate format with a small vial size to provide a tool for higher throughput sample grinding. Each set (to be ordered separately from VWR) includes chemical-resistant polyethylene or rugged polycarbonate vials, each with a threaded cap and one stainless steel grinding ball (set 12621-172 includes two balls per vial), and a plastic case with a foam well rack. With the homogenizer, the 24-well vial set can pulverize corn kernels into dry powder in 2 minutes; while the 5-well vial set can grind pooled or larger samples, such as 15 lyophilized corn kernels, for field trials. Grinding balls (to be ordered separately from VWR) are used to bead beat plant tissues, seeds, and animal tissues. Balls are made of 440C tarnish-resistant stainless steel and can be retrieved with a magnet. Balls are treated prior to packaging to remove residual oils and contaminants. Balls with 9.5mm (3/8") diameter are used with 4mL vials to homogenize seeds and larger samples of animal tissue. Balls with 11.1mm (7/16") diameter are used with 15mL vials to grind larger substances, such as pooled seeds. Balls with 4mm (5/32") diameter are used with deep well plates to homogenize leaf punches and 50mg or less of animal tissue. The 24-pin ball removal magnet (to be ordered separately from VWR) can be used to remove grinding balls from vials before samples are added, then to drop them back into vials once samples are administered, using the magnet stand/ball separator to aid with alignment. Each 5.1cm (2") pin is capped with a strong neodymium rare earth magnet capable of holding multiple grinding balls. The pin can also remove smaller grinding balls from deep well plates. The magnet stand/ball separator can be used to hold the 24-pin ball removal magnet when not in use. Magnet pipet tips (to be ordered separately from VWR) remove stainless steel grinding balls from vials or deep well plates. They are made to fit most pipets with \<200µL capacity. The ball dropper/bead dispenser (to be ordered separately from VWR) can be used to add 4mm (5/32") stainless steel balls to deep well plates, and to dispense small grinding beads into empty micro-well plates. Consists of ball dropper, reservoir tray, grinding bead swipe card, and plastic retaining sheet.